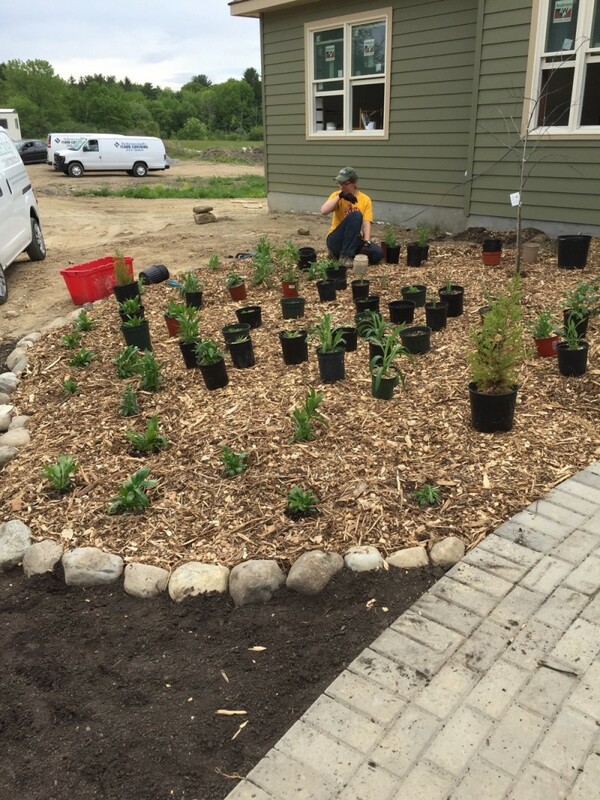 This year we had the honor of being asked to do the design and installation landscaping for a new home built by the construction company Halfmoon Construction. The new home will be net zero for meeting and exceeding the highest energy efficiency standards. Creating a habitat garden system and sustainable landscaping to co-exist with this beautiful house was a delightful experience. Only native plants, indigenous to New York State, were used in the gardens. The surrounding neighborhood’s ecosystem will be greatly improved and strengthened by the biodiversity and richness of the gardens here. As this year unfolds into the next and thereafter, the wildflowers, trees and shrubs from the landscaping at this site will load up the region’s seed bank with fertility and hope for the future. One area was planted with Sedge Grasses (Carex sp.). It will be calming visually when it’s filled in, like a monolithic sea of green. There are several rare butterfly species that use Sedges to complete their lifecycle, so that makes this Carex landscaping a unique type of butterfly garden.